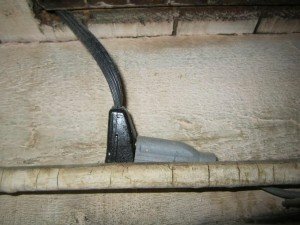 Does this look like a safe installation? The above image is what we found when we went to this home after the home owner became concerned over a burning smell. The cords for the refrigerator and the oven were extended with adapters and extension cords to allow an ungrounded receptacle to supply power. The extended connections were heating up causing burning at the device. The cord on the image above was routed through the return air grate and the other was bored through the floor. 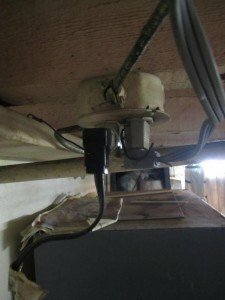 These installations are not recommended and are less than safe. Lauterborn Electric recommends that a grounded circuit be installed to power your home appliances. In some situations, depending on the wattage rating of the appliance, a dedicated line is needed. 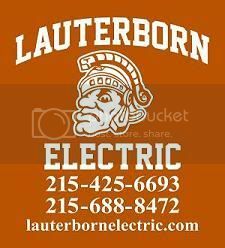 Contact your licensed Philadelphia electrical contractor Lauterborn Electric for further evaluation of your homes appliances.